Nong Nooch Tropical Garden taught an orphaned elephant it rescued how to swim to help it recover from an injury and prepare to return to the forest. 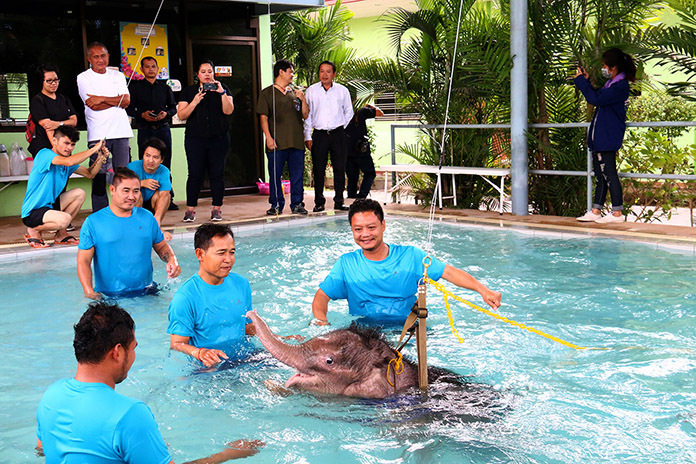 Kampol Tansajja, director of the Najomtien park, oversaw the Jan. 5 hydrotherapy session for 6-month-old Fa Jaem, conducted by veterinarian Padej Siridamrong at the Pet Rehabilitation Center and Dog Training Center of Nernplabwan Animal Hospital in Pattaya. The vet team helped the baby elephant get into a pool and supported it with a sling, keeping its head above the water until the animal could swim on its own. The pachyderm was rescued after it got its leg stuck in a trap on Khao Kang Hang Maew in Chanthaburi. 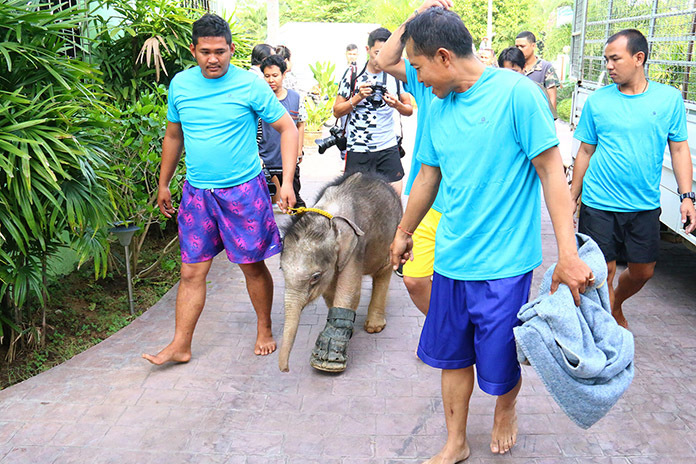 The orphan was first seen wandering alone on Khao Anglanai in Chachoengsao Oct. 19 then rescued later, brought to a veterinarian in Chachoengsao and transferred to Nong Nooch for better care. It was welcomed and named at a ceremony Oct. 25. The vet team helped the baby elephant get into a two-meter-deep pool and supported it with a sling, keeping its head above the water until the animal could swim on its own. It didn’t take long until the animal was using both its front and back legs to stay afloat. Currently the animal’s leg is splinted with support added to equalize the length of the legs. But the animal has been loathe to put weight on the injury, causing the muscles to become weak. Padej said the elephant’s left foot was hurt and became infected. He eventually had to excise about 12 centimeters of dead tissue from the sole of the foot, but that made the baby’s legs uneven and it took even longer for Fa Jaem to recover. The young lady is given a welcome bath after her swim. The hydrotherapy was intended to help her muscles relax and, by swimming, muscle strength can be regained. An hour of therapy is planned for every other day. Kampol said Nong Nooch has been caring for the elephant for 75 days and, other than its foot injury, is fine. It has been breast feeding from a female elephant at the park and, when the foot is recovered, the animal will be released again into the wild. Previous articleDoes your life have a pattern?